7 truths exposed in Kulbhushan Jadhav episode - Will India finally learn? 1. Where has the Cultural Exchange Bandwagon vanished? People to people contact on cultural similarities has been considered a centerpiece of the peace theory between India and Pakistan. It has been claimed by peaceniks again and again how Indo-Pak conflict is political -- how civilians shouldn't bother about the politics and continue to pursue peaceful relationships with Pakistanis. All of that falls flat, when Pak army openly follows a policy against Indian civilians. Any Indian can be kidnapped on flimsy suspicions of espionage, like the two maulvis who visited Pak,and now businessmen like Kulbhushan Jadhav. Essentially, for Pakistan army, all Indians are spies. How can cultural interaction even be suggested with a regime which takes such an aggressive stance against a nation and it's inhabitants? Though suddenly, there's a deafening silence from the 'Peace Fool Lobby'. Human rights, left media, Kashmir apologists, JNU hooligans, suddenly everyone has lost their tongue. They will soon be back though as soon as another major terrorist is shot dead by our soldiers. There's a positive change as well, probably the first time, an Indian govt is visibly serious about an Indian life. From the first day, Indian administration has been actively pressuring Pakistan both diplomatically and in international forums on their conduct. While Sarabjit and many others were sacrificed due to painstakingly slow action and sarkari apathy. In comparison to Pakistan, bleeding hearts should be singing praises of India's magnanimity, remembering the proper trials that Ajmal Kasab, Yakub Memon and Afzal Guru received. Nobody beheaded or mutilated Burhan Wani either. But that probably will be too much to ask from the likes of Prashant Bhushan and Arundhati Roy, who essentially provide debate points to India's enemies. Kulbhushan Jadhav episode also exposes several qualities of our ever-disturbed neighbor - cowardice of it's intelligence, hand-in-glove operations with terror groups, autocracy of Pakistan army, impotence of civilian government and a joke of a judicial system. Were we relying on this circus to procure justice for 26/11? Did we not already know Pak's failed status -- probably, more than anybody else in the world? Who is more foolish than us? What though should not happen for the millionth time is that Kulbhushan Jadhav episode doesn't become just another instance of India showing tolerance. There's a thin line between showing tolerance and showing weakness. India has been showing weakness for a long time, waiting for the world to rise and applaud us for our patience and tolerance. Not gonna happen. India needs to realise that democracies deserve democracies. Barbaric will use your systems against you. Pakistan has mastered the art of strategic denial. India needs to shed it's world-guru-of-peace-and-fairness image, it's a fantasy, and start talking to Pakistan in the language it understands. Not once, with some odd surgical strike followed but self back-patting in media, but again and again, by actively pursuing a systematic disintegration of Pakistan, through a thousand-cuts if possible. 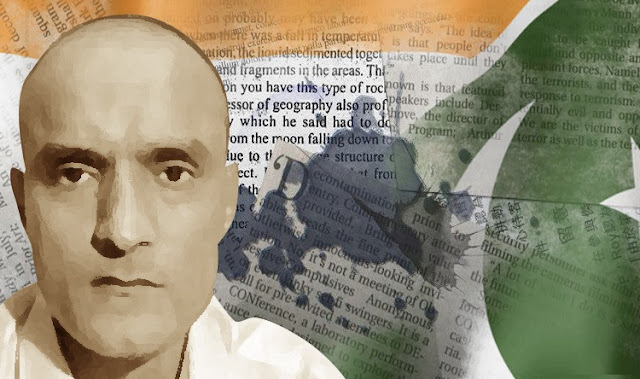 Indian Exponent: 7 truths exposed in Kulbhushan Jadhav episode - Will India finally learn?